Muslims around the world are protesting after an amateur US-made film insulting Prophet Mohammed appeared online and a French satirical magazine published cartoons of the founder of Islam. ­The wave of Muslim demonstrations around the world has been raging for more than a week, and there is no sign of its cessation. Over the days of the protests, which turned violent at times, over 80 people were killed and hundreds were injured. 16:30 GMT: Thousands of demonstrators marched through the north-central Nigerian town of Kaduna on Monday to protest the US-produced film Innocence of Muslims. "We are holding this protest to express our outrage over the movie that blasphemed Islam," Mukhtar Sahabi, a protest organizer and member of the Islamic Movement, told AFP. No incidents of violence were recorded. Tens of thousands of people also demonstrated in Nigeria's second largest city Kano on Saturday. 16:00 GMT: An estimated 20,000 Sri Lankans carrying anti-US placards marched on the American embassy in Colombo on Monday in response to an anti-Islamic film produced in the United States. Security across the country has been heightened as Sri Lanka is hosting Twenty20 cricket tournament. The demonstrators held a prayer session outside the embassy, which was barricaded by local police, before dispersing peacefully. No violence was reported. It was the second such protest organized by Muslims in the Buddhist majority country in four days. At least 40 people were detained in Athens after approximately 600 protestors clashed with police on Sunday as they tried to approach the US embassy. Police used tear gas to disperse the crowd after being pelted with plastic bottles and other objects. ­16:04 GMT: Some 400 people gathered outside French embassy in Tehran, Iran, to protest against cartoons mocking the Prophet Mohammed, which were published in French magazine Charlie Hebdo. People were chanting “Death to America”, “Death to Israel”, and “Death to France”. 13:39 GMT: Hundreds of protesters gathered in Athens shouting, "We demand an immediate punishment for those who tried to mock our Prophet Mohammed" as they prepared to march on the US embassy. There were brief moments of tension when some demonstrators hurled bottles at police, who responded with tear gas. 11:00 GMT: Iranian students are to gather on Sunday in front of the French embassy in Tehran to protest against the publication of cartoons of the Prophet Mohammed, Press TV reports. 07:44 GMT: The head of the ultra-conservative Islamist Salafi Nour party has called for the Egyptian president and other Muslim leaders to address UN with a demand to criminalize the contempt of Islam. 01:00 GMT: Some 1,500 German protesters gathered outside the US Embassy in Toronto on Saturday to protest against the anti-Islam film. 23:50 GMT: Some 300 people took to the streets of Karlsruhe, Germany, to protest against the “Innocence of Muslims,” AP reports. 23:00 GMT: Paris police has detained about 50 people as they raided Muslim neighborhoods to prevent an unsanctioned rally in the French capital. Many of those detained were women wearing traditional Muslim headscarves, which are banned from being worn in public in France. Paris authorities barred any anti-film or anti-cartoon protests in the city. 18:31 GMT: French police have arrested a man, who allegedly was calling on a jihadi website for the decapitation of the editor of the Charlie Hebdo magazine, which published cartoons mocking Prophet Mohammed. In central Marseille, France, police detained a man, who tried to protest against the cartoon, despite the ban on mass demonstrations. A police helicopter and 60 riot police were deployed there. 18:25 GMT: Some 1,500 people have staged a peaceful protest in Germany against an anti-Islam film that’s caused widespread offence amongst Muslims. The protesters marched through Dortmund city center culminating in a rally, the crowd included many families with children. 15:16 GMT: Russia’s Republic of Dagestan has partly closed access to the anti-Islam film. 14:34 GMT: Google has met Jordan’s request to block all links to a US-made anti-Islam film posted on YouTube. 12:58 GMT: A Pakistani Cabinet minister has offered a $100,000 reward for the death of the filmmaker behind the anti-Islam film. He urged the Taliban and al-Qaeda to help locate and kill him. 11:52 GMT: Protesters have clashed with police in Dhaka, Bangladesh while demonstrating against the film “Innocence of Muslims.” Officers fired tear gas and used batons to disperse the stone-throwing protesters who burned several vehicles. Dozens of people have been arrested. 11:34 GMT: Tens of thousands of Nigerian demonstrators take to the streets of Kano to protest against the film “Innocence of Muslims.” The protesters were shouting, "death to America, death to Israel and death to the enemies of Islam." 16:09 GMT: More than 10,000 Libyans are marching through Benghazi, demanding the disbanding of powerful militias throughout the city. The march is part of the new public backlash against militias sparked by last week’s attack against the US consulate. 16:08 GMT: Protesters torch a church in the Mardan town of Khyber-Pakhtunkhwa, Pakistan. 15:53 GMT: US Secretary of State Hillary Clinton reminds governments of their “solemn duty” to protect diplomatic missions. 15:52 GMT: 200 Moroccans protest outside a mosque in the city of Sale, chanting anti-US slogans and denouncing President Barack Obama, AFP reports. 15:31 GMT: KFC closes all Pakistan restaurants amid anti-American protests. 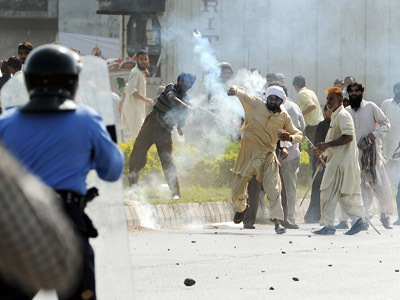 15:12 GMT: Pakistani officials say at least 15 people have been killed in Friday's clashes between protesters and police. 14:47 GMT: 195 protesters have been injured in nationwide clashes with Pakistani police. 13:53 GMT: Pakistani president Asif Ali Zardari and Prime Minister Raja Pervaiz Ashraf have expressed grief over the death of a television station worker in Peshawar. In separate messages, they urged the nation to remain peaceful during the protests. 13:47 GMT: Unconfirmed reports from Express News say that the death toll in Karachi, Pakistan could be as high as 14, with as many as 80 people wounded. 13:22 GMT: Egyptian demonstrators have gathered outside the French Embassy in Cairo to protest against the recent publication of Prophet Mohammed cartoons by a French magazine. Protesters were changing anti-US and anti-French slogans, calling on the government to cut ties with Washington and Paris. 13:03 GMT: Three explosions have been reported at the Pakistan Industrial Development Corporation (PIDC) building in Karachi. The blasts are believed to be fuel tanks of burning vehicles exploding. Reports of an Islamist mob moving toward the Chief Minister House and nearby hotels. 12:47 GMT: Three police vans have been torched outside the Chief Minister House in Karachi, Pakistan. 12:46 GMT: Police have chased away protesters and clamped down on a curfew in parts of Indian-controlled Kashmir. In the city of Srinagar, officers fired tear gas to disperse nearly 30 women who were chanting “Down with the US” while marching under the banner of the radical Islamic women’s group Dukhtaran-e-Millat . 12:16 GMT: Mobile phone services have been partially restored in the Pakistani towns of Karachi and Lahore, after being shut down by the government. 12:11 GMT: Very heavy security presence is reported on the streets outside the French embassy in central Tunis. Riot police are circling outside the embassy and officers are not allowing people to gather, according to an Al Jazeera reporter. 12:07 GMT: A fast-food restaurant in the industrial area of Karachi, Pakistan has been set on fire, while a cinema in the Landhi area has been trashed. 11:43 GMT: Thousands of people have converged on a guarded neighborhood which contains the US consulate in Pakistan's port city of Karachi. 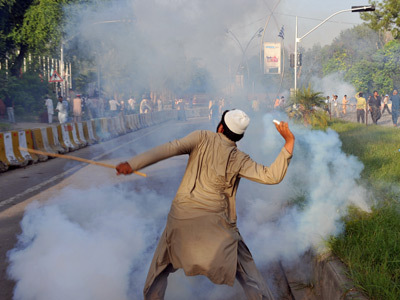 11:20 GMT: Three people have been killed in Pakistani protests. One was a TV station’s driver, who was seriously injured by police gunfire, which hit his car, and later passed away in a Peshawar hospital. Two others were police officers fatally wounded in clashes with protesters in Karachi. 11:10 GMT: The US closed its embassy in India’s New Delhi on Friday amid concerns of violence during protests over the anti-Islam film, sources told AFP. Employees were asked to stay on the heavily-guarded compound. The embassy school was also closed, while US citizens in India were advised to exercise caution. 10:55 GMT: Pakistan has summoned the US Chargé D'Affaires, Ambassador Richard Hoagland, to file a complaint about the amateur film attacking Islam. Islamabad called on the US to take action against the producers of the movie and have it taken down from YouTube. The ambassador assured that the US government and the majority of Americans condemn the film. 10:51 GMT: France confirmed on Friday that it would not allow any street protests against the publication of Prophet Mohammed cartoons. Interior Minister Manuel Valls pledged to crackdown on any attempt to challenge the ban. 10:30 GMT: Two main streets in central Tunis and a major highway leading into the city are closed in anticipation of protests expected later on Friday, reports RT’s Anissa Naouai. 10:25 GMT: Afghan protesters have staged a demonstration in western Kabul against the insulting film and the French cartoons of Prophet of Islam, reports Iranian Press TV. 09:04 GMT: RT’s Paula Slier tweets that shops, markets, petrol stations have been closed in Pakistan, and transport is likely to be halted over concerns that new protests will be held. 09:03 GMT: RT’s Anissa Naouai tweets about busloads of police around the French embassy in Tunis. “Hoping for the best, preparing for the worst,” she reports. 08:55 GMT: At least 15 people, including three Pakistani police officers, have been injured in a crackdown on anti-US protesters in northwestern Peshawar. 08:41 GMT: RT's Paula Slier reports on Twitter that expat workers refrain from going outside across Pakistan. 08:33 GMT: Fierce mob in Pakistani Peshawar have reportedly stormed the building of Sarhad Chamber of Commerce and Industry, smashing windows and later setting a building on fire, witnesses report on Twitter. 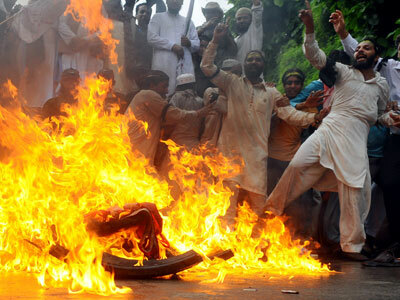 08:30 GMT: Pakistan declares a "special day of love" for Prophet Mohammed, as fresh protests begin. ­08:29 GMT: Pakistan suspends mobile services in major cities for most part of Friday amid fear of terror attacks, the country’s interior minister Rehman Malik says. 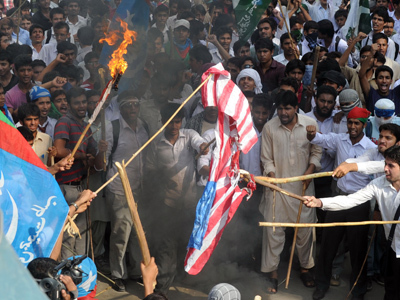 08:15 GMT: Pakistani anti-US protesters have torched two cinemas in the northwestern city of Peshawar, according to security forces and witnesses. One person was wounded, as police clashed with angry demonstrators who stormed one of the buildings. 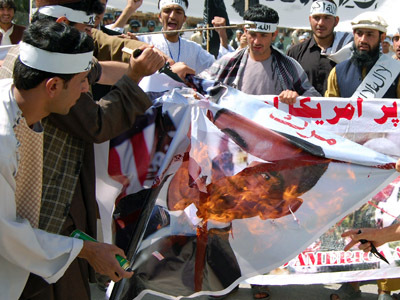 The actions start a day of massive protests against the anti-Islam movie following Friday prayers.